Talk about books that change your understanding of the world, this book really rocked me. It was originally published in 1969 and was inspired by Bobby Kennedy’s visit to the Mississippi Delta and the unimaginable suffering he saw there. That trip receives a lot of credit in the annals of history for transforming Bobby’s mission to fight for our most disadvantaged citizens. At least for me, having never been close to extreme poverty, the human stories I read about in this book were eye-opening and revealing in ways I still can’t completely comprehend. This book was re-published because for the most part, these conditions still exist in many places in the world. I’ve found that awareness is usually the beginning of an awakening inside of someone to strive to use their advantages to help those that need it most. At least, it always has been for me. 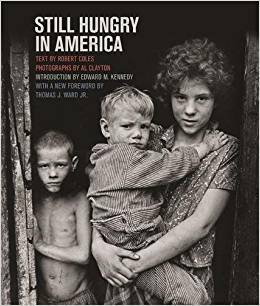 Originally published in 1969, the documentary evidence of poverty and malnutrition in the American South showcased in Still Hungry in America still resonates today. The work was created to complement a July 1967 U.S. Senate Subcommittee on Employment, Manpower, and Poverty hearings on hunger in America. You’re a photographer or student of photography. This book has such amazing, powerful images.